Berita baik buat peminat dan penyokong kelab bolasepak Bayern Munich yang beragama Islam. Sebuah masjid dibina di stadium Allianz Arena, Germany. Bayern Munich, the club's official website, announced the opening of a Masjid at the Allianz Arena, a stronghold of the Bavarian club, and it will be the first Masjid in any world stadium. The initiative came after Frenchman Bilal Ribery (Frank Ribery) a striker with the club, proposed to the club management that they allocate a small room for prayer on the pitch for him and other Muslim players. But the reaction of the management of the club was unexpected, as they ordered the building of a proper Masjid for Muslim players and fans and with an imam and his office together with Islamic and science workshops and paid 85% of the value of construction and the rest made up by the players and fans who wanted to contribute to the construction of the Masjid and obtain the rewards. This is the Masjid Watch the shoe compartments where they are equipped with lights to indicate vacant (green) and occupied (red). Not just does this exhibit true Islamic values amongst the people but the creativity of the Germans in the Masjid set up is truly very Islamic as well. Unbelievable. 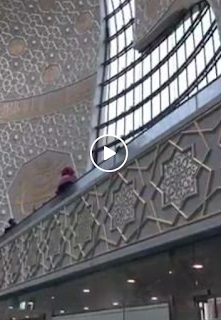 A Masjid of this architecture at Alianz Arena in Germany!